AFRICANGLOBE – Africa’s richest man is pushing to dominate its market for cement, the material at the heart of the continent’s infrastructure boom. All that stands in his way is the world’s biggest cement maker, a flood of low-priced imports, the threat of slowing growth in contracts for dams, ports and roads and a slump in the most-traded emerging-market currencies to a record low. 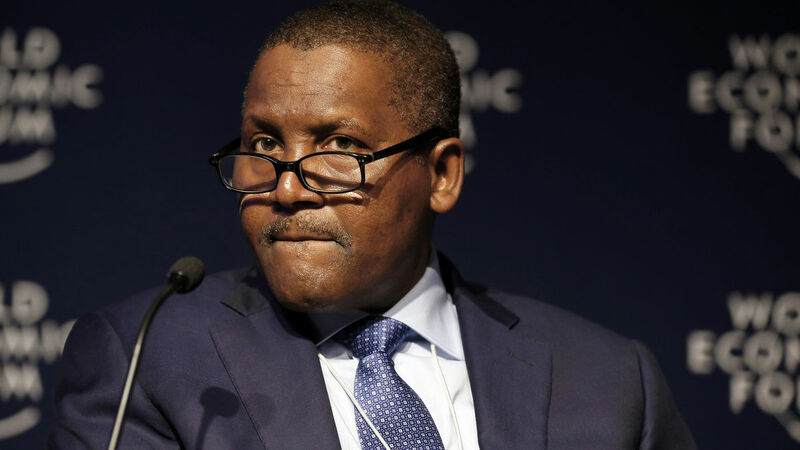 It’s not stopping Aliko Dangote. The plant will help bring Dangote Cement Plc’s total production capacity to 43 million tons by the end of this year, within striking distance of the African capacity of market leader LafargeHolcim Ltd. — which runs its own Zambia factory about 30 kilometers (19 miles) from the plant Dangote was opening. Dangote Cement, which has expanded capacity five-fold in the last four years, plans to about double potential output, to 80 million tons, Dangote says. The Ndola plant is one of five new factories he’s opening this year across Africa, including two in the LafargeHolcim strongholds of Cameroon and Zambia. Africa has become one of the world’s fastest-growing regions for the building material as rapid urbanization and spending on transport, power and shipping boost demand. Significant projects under construction include Ethiopia’s $4 billion hydro-power dam on the Blue Nile River and a $13 billion railway that will link the Kenyan port of Mombasa to the Rwandan capital of Kigali via Uganda. With 50 million tons a year of cement capacity, LafargeHolcim is the largest producer in continental Africa. Domestic producers also must compete with cheap imports from countries including Pakistan, according to analyst Sonia Baldeira. LafargeHolcim shares rose 3.7 percent at 2:10 p.m. in Zurich, while Dangote Cement was unchanged at 164.50 naira. The additional production from Dangote’s new factories is already having an effect on local cement markets. In Senegal, the company says it provides more than 30 percent of all cement sold in the country, where it opened its first plant in January. In Zambia, cement prices have fallen about 20 percent, a result of Dangote’s push against LafargeHolcim, according to Sipho Phiri, who chairs a company planning to build a $180 million hydro power project in the west of the country. The project will need about 20,000 metric tons of the material so the price drop makes a significant reduction to his capital investment, he said by phone. And none of it will come from Lafarge Zambia Plc. Lafarge Zambia Chief Executive Officer Emmanuel Rigaux rejected Phiri’s claims that the company had taken advantage of its position. Lafarge Zambia is doubling capacity at its Lusaka plant in a 200 million-euro project as it seeks to capitalize on growing demand in Zambia and the Democratic Republic of Congo to the north. Increased competition and lower prices won’t change its plans, he said. Lafarge, which last month completed a merger with Switzerland’s Holcim Ltd. to form the world’s biggest cement maker, said in February last year it planned to increase Africa capacity to more than 30 million tons by 2017 from 20 million tons. The combined company had about 50 million tons of capacity on continental Africa at the end of last year. “Africa is a fast-growing region with huge construction needs supported by demographic trends and growing urbanization,” LafargeHolcim said in an e-mailed response to questions. The company “is well positioned to serve the continent’s construction needs from its existing strong supply network in cement with facilities in 15 countries” in Africa. The speed and scale of new investments in Africa’s natural resource-based economies may falter as commodity prices fall and growth slows in China, the biggest consumer of materials from copper to iron ore. A gauge tracking 20 of the most-traded emerging-market currencies depreciated 0.7 percent on Monday to a record low, making it harder for those countries to pay for imported materials. The market slump hasn’t changed Dangote Cement’s expansion plans, Carl Franklin, the company’s head of investor relations, said by e-mail late Monday. In countries including Tanzania, cheap imports, including from China, are weighing on prices and threatening margins for local producers. South Africa in May imposed anti-dumping duties on the material coming from Pakistan. The issue continues to challenge producers on the continent, analyst Baldeira said from London. Even so, the two biggest cement producers in Africa aren’t the only ones expanding. Johannesburg-based PPC Ltd. is building new plants in the Democratic Republic of Congo, Zimbabwe and Ethiopia, and has started production in Rwanda. HeidelbergCement AG of Germany added 2.9 million tons of capacity in Africa last year, its biggest growth region. The company’s pending takeover of Italcementi SpA may double its market share in the Middle East and Africa, according to data and HeidelbergCement predicts that cement demand will expand 50 percent by 2020 in the Africa region.